We knew it was coming. Still, when it arrived, the invitation hit us between the eyes. Chaim was getting married! Chaim, my brother’s son, who had been affected by a strange virus as a baby and was never the same thereafter? Chaim, who struggles with his words, his balance, and with his grasp of situations? Chaim, whose bar mitzvah I chronicled 16 years ago, was actually getting married?! And the answer was a resounding Yes! Chaim is tall and gangly, shaky and awkward. He spent his childhood in special schools and for some years now has been living in a supervised residence with people who have disabilities. I’ve long maintained that the professional staff and guidance counselors there are angels in human form. They so lovingly and patiently help these young people every day with all their ordinary routines. Every time I see them in action I am overawed. And then Chaim met Tamar at a day program under the auspices of an outstanding organization called Yachad. It was quite spontaneous and, to the pleasant surprise of the staff members, Chaim and Tamar went on to spend hours talking to each other. It was wonderful and most intriguing to see how they connected. The social workers and counselors encouraged the relationship which, eventually, with the blessings of their parents and the experienced professionals, became a shidduch (match). Chaim has a neurological condition and developmental disability. Tamar has Down syndrome. What a wonderful match! Chaim is over 6 feet tall and Tamar barely reaches his shoulders. But if there ever was a match made in heaven, then this is the one. In fact, I’m just beginning to get an inkling of what our sages may have meant when they said that since the creation of the world, G‑d has been busy making shidduchim. Diminutive as she may be, Tamar is respected as a feisty young lady with a mind of her own. Chaim loves people, he loves dressing up for shul and going out. To see this couple under the chupah, he in a kapota and black hat, just like his brothers before him, and she in her beautiful wedding gown looking as radiant as any bride, brought beaming smiles and torrents of tears to the large crowd of guests. For the sheva brachot at my sister’s home, I composed some grammen, a traditional Jewish form of rhyme. I said that “at the chupah, 600 hearts were swelling, while their grandparents in heaven were kvelling.” Even the photographer, a seasoned professional, confessed that, while he’s done many hundreds of weddings, this was the first time he ever cried at a chupah. We all pray that their relationship will blossom. 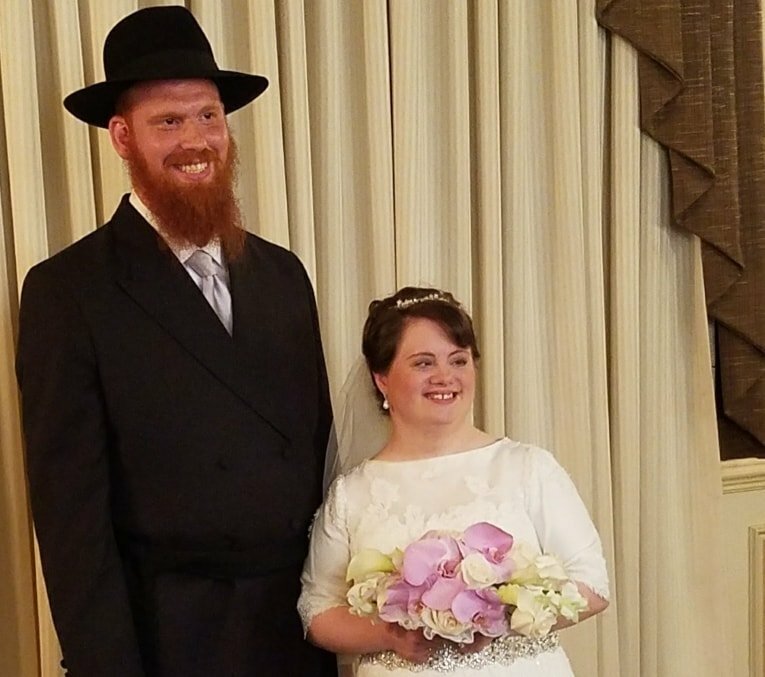 With the love and support from their families, friends and counselors, this special couple will build a beautiful life for themselves filled with personal happiness to the nachas of all their loved ones. What incredibly loving, supportive, and wise parents Chaim is blessed to have. Of course, they too, have their moments. Don’t we all? But to have nurtured Chaim to this point in his life speaks volumes of their deep love, unswerving commitment and resolute tenacity. It was their own personal experience that inspired them to establish a fund to assist parents with Jewish special education tuition fees. Their main fundraiser is an annual concert in Brooklyn which is the musical and social highlight of the year for their Crown Heights community. Although I only got to meet them at the wedding, I know that Tamar’s parents are made of similar stuff. I also had the opportunity and privilege of meeting some of Chaim’s friends. They’re quite a crew. Each is unique in his own way, and there is a beautiful camaraderie between them. At the aufruf, they all came to my brother’s house for a Kiddush-lunch and it was particularly poignant (and also quite funny) to hear each of them impatiently waiting their turn to give Chaim their sincerest blessings for his future. Actually, come to think of it, I guess Chaim is just like all of us. Aren’t we all a complex, complicated mix of so many different emotions and characteristics? Don’t we all have our good times and bad? Aren’t we all gracious and courteous one day and quick-tempered and abrupt the next? Haven’t we all experienced those moments when we weren’t on our best behavior and regretted things we said or did? I learned that people with cognitive disabilities are really the same as the rest of us. We’re all an interesting configuration of so many diverse facets. We all have our gifts and talents, our faults and foibles. We all have our skills and expertise, our eccentricities and idiosyncrasies. I concluded my little song with these words. We should all say baruch Hashem, and regret whenever we complained or we grumbled. Because when we look at our chatan and kallah, we can only be humbled. The Ruderman-Chabad Inclusion Initiative (RCII) is dedicated to building on the philosophy and mission of Chabad-Lubavitch by providing Chabad communities around the globe the education and resources they need to advance inclusion of people with disabilities. RCII engages Chabad’s network of human and educational resources to create a Culture of Inclusion so that all Jews feel welcomed, supported and valued throughout their entire lifecycle. How lovely to hear about your cousin and husband. I'm so happy to hear about these success stories. I am a retired Banker and worked with severely mentally challenged adults as a volunteer. I always felt that if given a chance some of them may have had an opportunity to find happiness only if they were given a chance. I wish your cousin and her husband many years of happiness and health. May G-d bless both of them and their two wonderful children. I'm conflicted about this honestly. While both parties seem happy with the marriage I can only wonder if they are (both) truly able to both consent & understand what they are getting into. I wish Tamar & Chaim all of the very best. We should avoid labels, as, these, are hurtful. Telling about Jewish people, or those who are not, in a derogatory fashion, does, in fact cause them, and others of us, who feel comiseration, pain. A great amount of pain. What a beautiful testament to your relationship with your nephew, the chatan, and his lovely kallah. 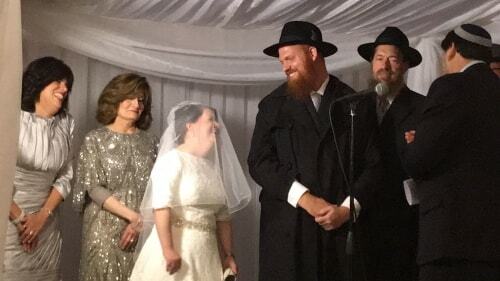 I was so glad to have been there at this unbelievable simchah , to experience the joy and happiness, and to see all of you and your families after so many years. Everyone I spoke to about this wedding, Jew and non-Jew, were so inspired by this beautiful couple. I wish them only good things and a life of good health, happiness and joy. As you said, we can only be humbled by this couple.